Well we're into the first week of autumn here in the U.S. but I'm not quite ready to release summer yet, even though it was an unusually wet and mild one. I still want those songs and albums that at first dare you to dance around and sing along but then finish you off with a purple sky dusk that leeches lithium into your brain through your ear canals. Leaving you at peace with yourself and your surroundings. But I don't have that band today, I do however have a great transition band that will ease you into autumn by feeding you sweet, hooky punk songs good enough to get you moving in your Chuck's, filled with sardonic woeful lyrics about the sourness and frustration of simply trying to live a life. Seattle, Washington's Wimps is a trio made up of Rachel Ratner (vocals/guitar), Matt Nyce (bass), and Dave Ramm (drums). Although Rachel is the only woman in the band, Wimps summons the early 90's riot grrl sound with their call-and-response vocal delivery and punchy riffs. I had dreamy visions of early Sleater-Kinny and Bikini-Kill upon first listen and was excited to hear more. 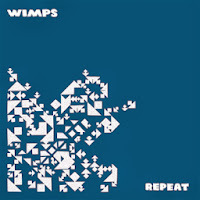 Repeat is Wimps’ first full-length record, following a self-released five-song demo in early 2012. There was a limited cassette run on 1234 Go! Records earlier this year and the album is now out on wax via End Of Time Records.